You don't win a World Cup as much as you will a World Cup. The past three finals ended in a draw at full-time. Eight of the past 12 have been decided either by a single goal or in extra-time or penalties. Once you get there, it's as much about nerve and randomness, blades of grass that make a ball bounce just so or specks of dust that make you react that split-second later, as it is about who is objectively better. Bear this in mind when looking at Russia 2018. Because while there are four teams (Brazil, Spain, Germany and France) that are clearly a notch above the rest -- and that, were this a traditional home-and-away round-robin league, you'd expect to finish in the Champions League spots -- little is guaranteed. The tiniest pebble can derail them as easily as the most unexpected loss of nerve. Brazil are favorites and, since Tite took over the helm two summers ago, have been all "Eye of the Tiger." It's more than understandable: For the Selecao, it's not just about pursuing the sixth World Cup but about mitigating (because it can't be erased) the pain of the "Mineirazo," the 7-1 semifinal drubbing on home soil that will forever haunt the nation. Neymar, the world's most expensive player, is back from injury, the midfield has a blue collar tint and the goalkeeper, Allisson, is one of the best around. These are men on a mission. 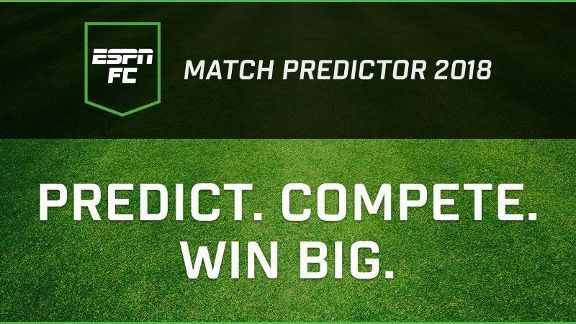 - Make your picks with ESPN FC Match Predictor 2018! Germany, the villains (to Brazilians anyway) four years ago, will try to become the first nation in 56 years to win back-to-back World Cups ... since Pele's Brazil in 1958 and 1962. Teutonic efficiency lends itself to facile stereotypes but the facts back it up. They've reached the final four in each of the past four World Cups and the past three European Championships. They have the mentality, the experience and plenty of quality. Plus they have the unflappable Jogi Low, under whose jet-black, bowl-cut hair resides a brain capable of dispensing nurture, tactics and discipline in the right proportions. Spain, world champions in 2010, had turned to a hotshot named Julen Lopetegui to wipe the stain of two lackluster major tournaments in a row. However, he became so hot that Real Madrid appointed him as Zinedine Zidane's successor after the tournament, whereupon the Spanish FA decided to dispense with his services. It is a twist few expected and the question is what effect it will have on those he leaves behind. Fernando Hierro will take charge and inherits a gifted mix of youngsters and veterans, with the incomparable Andres Iniesta readying for his World Cup swan song. France are arguably the most gifted of them all, from Samuel Umtiti to Raphael Varane at the back, to N'Golo Kante and Paul Pogba in midfield, to Kylian Mbappe and Antoine Griezmann up front. In fact, they're so talented and so deep that you wouldn't bet against a team of French players who didn't make it into Didier Deschamps' squad advancing to the quarterfinal. The issue, possibly, is one of veteran leadership and perhaps Deschamps himself. After coming up short at Euro 2016 on home soil, he's under pressure and the vast array of options can sometimes lead to confusion and second-guessing. The eternal rivals, Cristiano Ronaldo and Lionel Messi, once again lead Portugal and Argentina respectively to teams that are doing their best to manage expectations. The defending European champions are aging, especially at the back, and having defied expectations in winning the Euros, you wonder how many miracles they have left. Argentina are top-heavy (big stars up front, less so at the back) and it has been a bumpy ride to this point. For either of these sides to win it, you'd need the umpteenth Atlas performance from the two perpetual GOAT candidates. Managing expectations is also what England are seemingly doing. Coach Gareth Southgate thinks long term and while this may be the least gifted Three Lions group in many years, they are young and they are likeable. On the other hand, the clock is ticking for Belgium and their "Golden Generation" -- plenty of talent throughout the side but plenty of disappointments on the big stage. Their window will begin to close soon, meaning Roberto Martinez needs to squeeze out his masterpiece now. How far do you stretch the circle of potential winners? Uruguay may yet squeeze in thanks to arguably the best strike tandem around (Luis Suarez and Edinson Cavani) to go with the fresh legs in midfield, the wily warriors at the back and the sage Oscar Tabarez on the bench. Luka Modric's Croatia and James Rodriguez's Colombia are long on talent and somewhat shorter on consistency. But hey, it's the World Cup; you need to be good for only a few weeks. And then you get into "also-ran" territory. Russia are the lowest-ranked top seeds in World Cup history and have suffered a rash of injuries to boot. Poland and Denmark have world-class superstars (Robert Lewandowski and Christian Eriksen) whose coattails they can ride ... but only to a point. Mexico have been consistent in getting out of the group, but coach Juan Carlos Osorio's maniacal rotation has El Tri fans puzzled. Switzerland flew under the radar -- and were clever about playing the FIFA rankings game that determines seeding -- to get here, but you fear this is where they get exposed. Serbia have individuals (such as the magnificently unorthodox Sergej Milinkovic-Savic) more than they have a team. Peru have their charismatic captain, Paolo Guerrero, back for the World Cup and it has given the talented Ricardo Gareca hope on their big-stage return after 36 years, but World Cups rarely do fairy tales. Senegal are packed with talent (from Kalidou Koulibaly at the back to Sadio Mane up front) and may be Africa's best bet along with Morocco, a group made up almost entirely of players born abroad who have returned to defend the colors of their ancestors. Look out for Nigeria, too. This time the Super Eagles are flying somewhat under the radar without the hype of past World Cups. Then there's Mohamed Salah and Egypt. It's hard to root against the Liverpool star if only for the bright smile, but you wonder how the miles on the clock of a long season and the shoulder injury suffered in the Champions League final will affect him. As for Tunisia, they feel over-matched in a group with two blue-blood European powers and it will take a lot for the Eagles of Carthage to fly into the knockout rounds. The Asian contingent feels somewhat weaker than in years past. Iran, possibly the strongest side out of Asia, are saddled with a tough draw. Japan have been hit by a raft of injuries and South Korea are stuck between generations. Australia are also beginning a new cycle and they're doing it after the coach who took them through qualifying, Ange Postecoglou, quit shortly after getting them to Russia. As for Saudi Arabia, unless they get a result in the opener on Thursday their tournament could be ending real soon. Not much is expected of a Zlatan Ibrahimovic-less Sweden, though their Nordic brethren Iceland are evidence that you write off the men from the cold at your peril. Their mighty mouse exploits at Euro 2016 means that once again, some crazy percentage of the island will decamp to Russia. Costa Rica went all the way to the quarterfinals in Brazil, only getting knocked out on penalties, but lightning rarely strikes twice and on paper they too look over-matched ... though not as much as their CONCACAF neighbors, Panama, who look to be the weakest team in the tournament. But that's the thing. You can "look" the weakest before kickoff and it scarcely means a jot. You still get to write your own script and World Cups, more than most tournaments in any sport, live on in eternity. In short, every country has the opportunity to seize their place in their country's footballing lore.